Meet Blue Coat Chef Patrick. He is a valued member of our Blue Coat Army at Iowa State University. Patrick enjoys the freedom of running his own kitchen and the work-life balance of his job at Greek House Chefs. The genuine ‘thank yous’ and compliments from the men in his fraternity are what fuels Patrick’s love for being a frat chef. 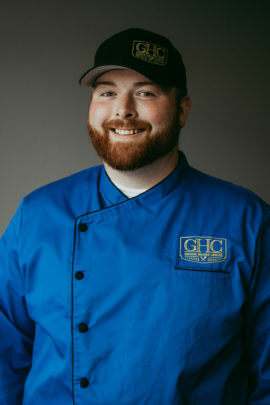 In addition to being a chef with Greek House Chefs, Patrick has been named a Certified Trainer for Greek House Chefs and often travels to teach other great chefs how to do things the Blue Coat Army way using fresh ingredients and a lot of love in their cooking. When Patrick isn’t pouring his heart and soul into the food he’s creating, he’s a dedicated father who loves to spend time with his wife and 3 children.